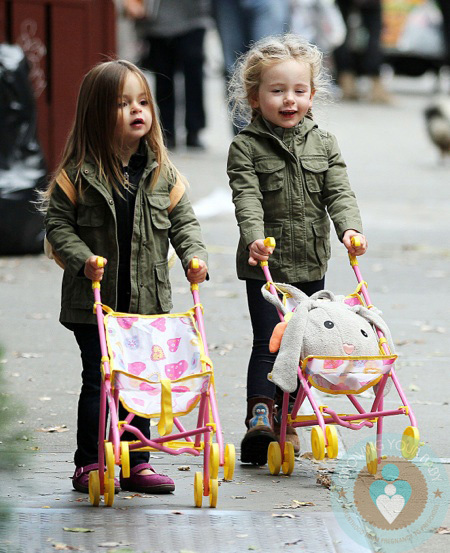 Out on Saturday(October 13th) the Broderick twins, Marion and Tabitha, were photographed taking a stroll with their buggys and nanny in New York city. The busy three-year-olds enjoyed a casual day out in matching green jackets and jeans. But taking fashion inspiration from their famous mom, Marion is wearing bright pink ballet flats while Tabitha wears simple, but sweet, Ugg boots. Sarah Jessica, can most recently be spotted singing and dancing on ‘Glee’ as a fashion guru to character Kurt Hummel. For now, she is spending a lot of time being a mom and her kids are really, really cute! Christina Aguilera Visits Mr. Bones With Her Son Max!